In 1565, Samuel Quiccheberg published the earliest known treatise on museums, the Inscriptiones vel tituli Theatri Amplissimi. Quiccheberg proposes a model for the ideal Wunderkammer as an ordered and comprehensive collection of naturalia and artificialia. A Wunderkammer was an encyclopedic collection in Renaissance Europe of types of objects whose categorical boundaries were yet to be defined. Modern terminology would categorise the objects included as belonging to natural history, geology, ethnography, archaeology, religious or historical relics, works of art and antiquities. Renaissance Wunderkammer were private spaces, created and formed around a deeply held belief that all things were linked to one another through either visible or invisible similarities, and the belief that by detecting those visible and invisible signs and by recognising the similarities between objects, there would come an understanding of how the world functioned, and what was humanity’s place in it. But although everything can be connected – mystically – that is not to say everything is connected. The Wunderkammer became a machine for both the birth of reason and the death of magic. The dilemma of the Wunderkammer could ( and should ) be celebrated like the failure of Babel – for its polyphony of wondrous and beautiful mistranslations, misreadings and misunderstandings, and its grasp of the power of objects and beauty of ruins. index: the geometry of Beuys, the mandragora, names for the Devil, the lost languages in which no books were written, Giordano Bruno On the Composition of Images, Signs and Ideas, the alchemical tree, the transcripts of Babel, Basilius Valentinus Ein kurtz summarischer Tractat, von dem grossen Stein der Uralten, Polpo, the Constructivist dart, the nautical charts from the Ship of Fools, Quaratesi saviour St. Nicolas, the devil’s footage of the temptation of St. Anthony, the Russian experiment, the damaged dragon of Bellini, the hieroglyphs which meant nothing, the glass domes ( through their transparency and shine, have the rare virtue of simultaneously animating and distancing the objects they cover), Mike Kelley’s Kandors, the inhabitants of Quixote’s windmills, MDF, Jorge Luis Borges Ramón Llull’s Thinking Machine, the experiments of Luigi Galvani, De Lama Lamina of Matthew Barney, wunderkammer as magic, wunderkammer as the death of magic. Gem of the spring, April’s eye . . .
Then the revelation occured: Marino saw the rose as Adam might have seen it in Paradise, and he thought that the rose was to be found in its own eternity and not in his words; and that we may mention or allude to a thing, but not express it; and that the tall, proud volumes casting a golden shadow in a corner were not — as his vanity had dreamed — a mirror of the world, but rather one thing more added to the world. Marino achieved this illumination on the eve of his death, and Homer and Dante may have achieved it as well. The Castle of Crossed Destinies (1986). 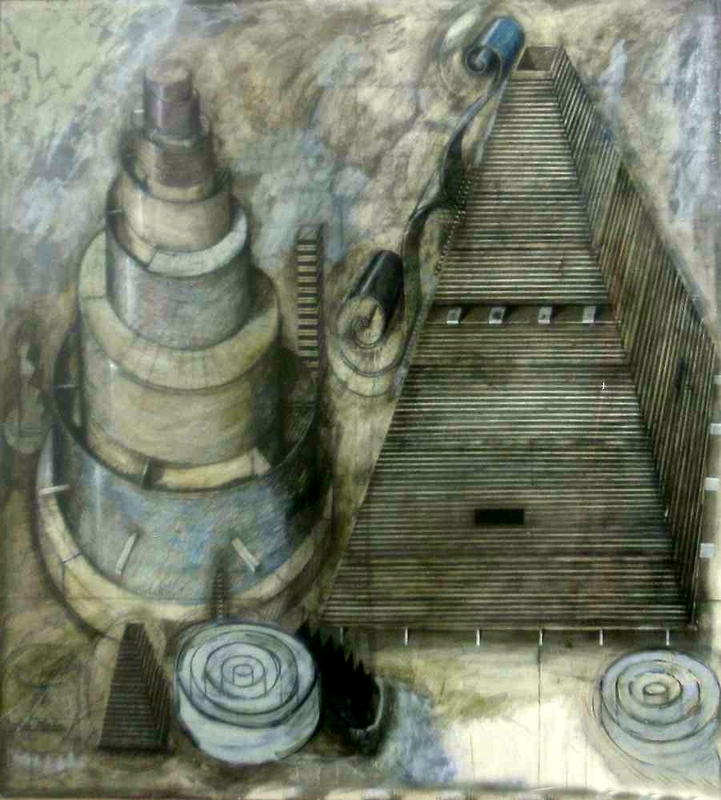 The Brothers Quay are known for their animated films but in the 1980s they were also working as book illustrators and stage designers. 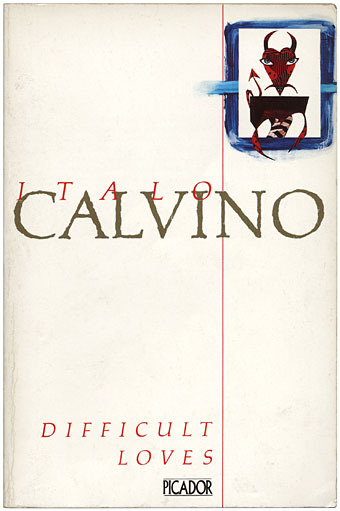 Here are some of their paperback designs for Italo Calvino, part of a series they produced for Picador when the books were reprinted after his death. Information about this aspect of the Quays’ work is virtually non-existent. A pity that the publisher managed to credit the designs to the “Brothers Quai”. 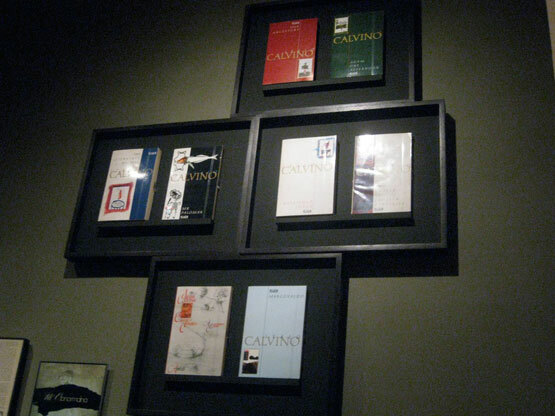 The Calvino covers by the Quays at MOMA 2012. 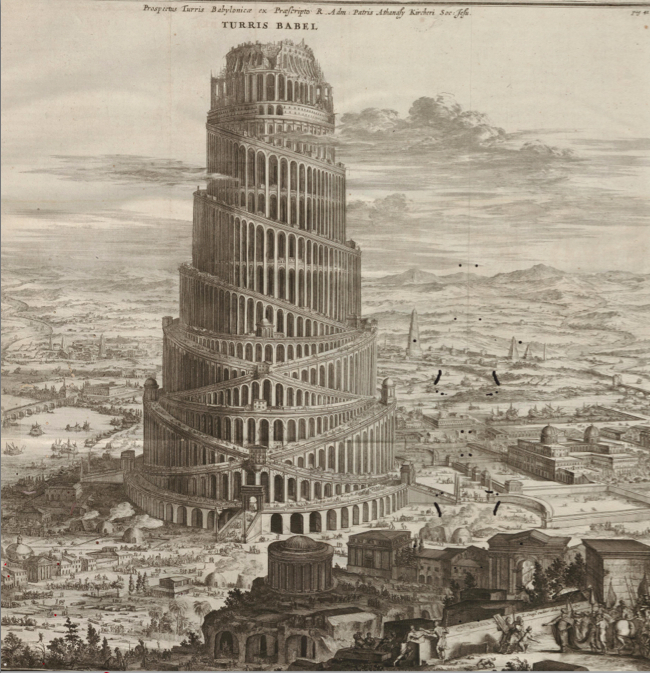 The last of his books to be published during his lifetime, Turris Babel was Kircher’s attempt to reconstruct the specifics surrounding the famous biblical story, recounted in Genesis 10-11, of Nimrod’s attempt to build a tower that reached the heavens. Apart from his interest in ancient civilizations and biblical historicism, the story was of particular interest to Kircher as an account of the origin of languages, and, by Kircher’s extension, of polytheism. The second half of Turris is devoted to Kircher’s theories on linguistics. 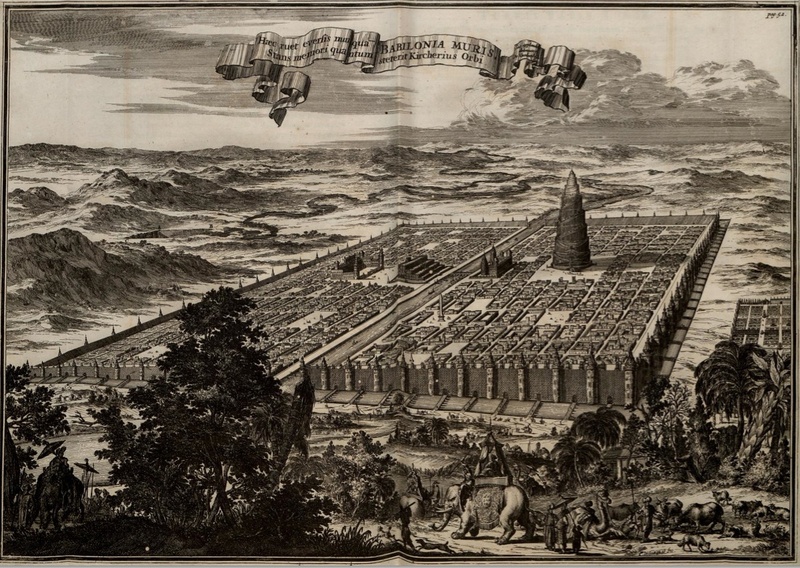 The first section, similar to his Arca Noë of four years earlier, contains an imaginative speculative expansion of the Tower of Babel story in light of Kircher’s knowledge of history, geography, and physics. 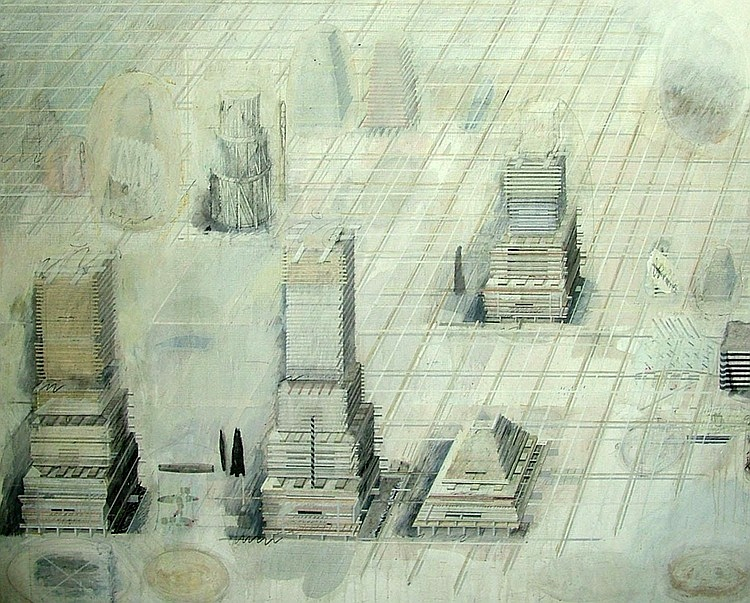 Landscape with Towers: Ian Howard 1981 , 80x100cm. Drawing. The Cremaster by Matthew Barney, a five part film cycle, was shown repeatedly during a retrospective of Barney’s work at the Guggenheim Museum in 2003. I drove down from Boston three times to see it and dragged my friends, family and children with me. It was all encompassing, brilliantly provocative, enigmatic and so engaging. In the words of curator Nancy Spector, Cremaster is a “self-enclosed aesthetic system.” It is chock full of thematic proclivities and Barneyesque tropes that get recycled in so many unexpected ways. Barney is a 21st century William Blake in his ability to construct a highly evolved cosmology that is conceptually big and fearlessly presented. That Guggenheim show was one of the most polarizing art events I remember in recent history, and everybody chose sides. Was he the most brilliant artist of his generation (my view) or is he, as my son contends, a talent who became grandiose and corrupted by money and fame? 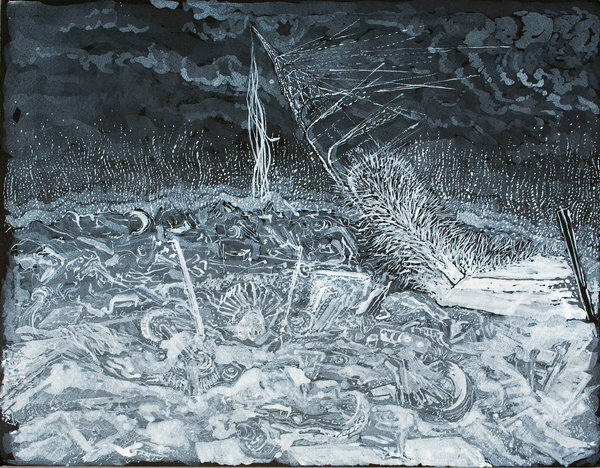 No matter where you come out on Barney, it is hard to find another artist who moves so easily from the epic-scaled Cremaster to a small, intricately intimate body of drawings and artifacts. For me he stands strong at both ends of that spectrum. I find his work beguiling, no matter the size. Subliming Vessel (what an evocative title with its suggestion of solidity moving into vapor) is appropriately positioned right next door to an exhibit about the Eucharist as portrayed in Medieval illuminated manuscripts. 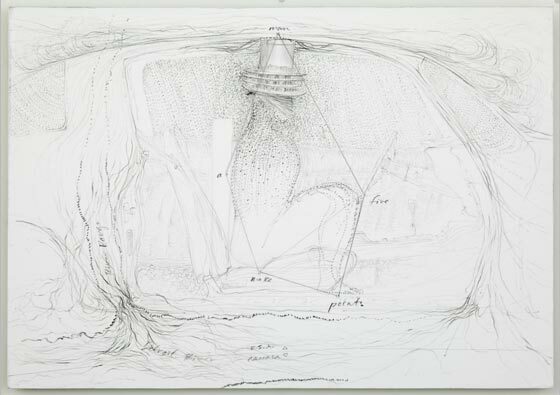 SV consists of over 100 drawings as well as “storyboards”—staged assemblages of items that revisit the narratives Barney has explored (or is still developing, such as his current project, The River of Fundament.) Each of these vitrines is a staged set of the myriad influences that brought Barney’s alternative realities into form. These curio cabinets are laid out meticulously and include open books that Barney picked for inclusion from the Morgan Library’s extensive collection of ancient texts. I was so enthralled by the work that I spent most of my afternoon in the exhibit. For those artists and writers who cultivate the inexplicable, irritation can set in when their constructs feel forced or exploitative. While Barney’s work is definitely hermetic and highly personal in its iconography, the threads of meaning are there to unravel and explore. The drawings revolve around their own narrative logic, exhibiting a hermeticism that precludes the potential for communal experience or shared emotion…Barney assembles networks of personally significant arcana (a practice manifested in the scrapbook-style collections of clippings, sketches, art objects and other items housed in the massive vitrines) that remain inanimate and unintelligible beneath his shimmering surfaces. The artworks are beautifully realized, but the viewer remains on the outside looking in. Not my way of seeing it, but I understand that point of view. (DAT ROSA MEL APIBUS “The Rose Gives The Bees Honey” after the original motto found in the engraving (possibly) by Johann Thedore deBry (d. 1598). This image of the Rosa Mundi, or Rota Mundi, is the solar wheel of Apollo, the Lord of movement, of the ever passing/present moment. It is the Solar Citadel, the abode of the Heart, the symbolic center of the Supreme Center which is everywhere centered at once. It is a door through which this invisible place may be accessed by one with a pure heart and an unblemished soul. If one gains access to the center of the rose, it speaks the “lost word” of Masonic lore, the Master Word which throws open the lodge doors of every sacred society. The following description of the original engraving upon which the DAT ROSA MEL APIBUS painting is based is given in Joscelyn Godwin’s definitive work on Robert Fludd. The Rose and the Cross: “The Rose gives the bees honey” (DAT ROSA MEL APIBUS). tThis explicitly Rosicrucian symbol was first used at the head of Joachim Frizius’s Summum Bonum, then adopted for (Robert) Fludd’s Clavis. A rose with seven petals each alludes, in all probability, to secret doctrines of septenary emanation such as were later to be publicized in the theosophical works of H.P. Blavatsky. The Rose surmounts the thorny cross, the whole resembling the sign of Venus in which the solar circle triumphs over the cross of matter. We may interpret the motto as saying that “spiritual knowledge gives solace to souls,” of whom bees are a venerable symbol. The spider’s webs (also with sevenfold divisions) strung on a grape arbor in the background, and the wingless insect on the rose (a spider?) may represent negative, lunar forces, as oppossed to the positive, solar one of the bees, both of which are reconciled by the philosophic rose. It is curious that Dr. Godwin fails to see the wings on the bee that has arrived at his destination, the rose! This winged bee is clearly represented in every reproduction of the rose engraving that your author/painter has seen…All of the other speculative symbolic observations hold, especially the observation that the image is one of the alchemical symbols of Venus, the goddess of Love. The seven circles of seven petals each symbolize the number of squares (7 squared = 49) of the magic circle of Venus, of the “intelligence” (as opposed to the Spirits) of the goddess. Seven in the Hebrew alphabet/number system represents Dagh, the Fish, symbol of Christ. Seven is also the number of the Babylonian God of good Fortune. Seven is of course the number of the Liberal Arts and also of the Deadly Sins. 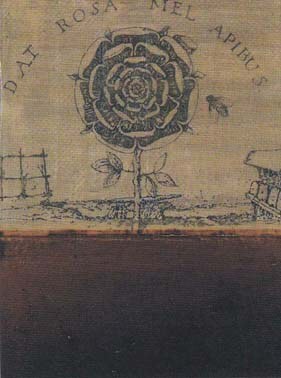 Without doubt, this rose engraving has over time become the consummate emblem of the order of the Rosy Cross, or the Rosicrucians, an essentially “invisible”order. Many individuals and groups have made claims to be the “true” rosicrucians, however, since the original manifestos appeared in the early 16th century the jury has been out concerning who they might actually be. These documents were designed to give the appearance of a Christian utopian group based on the model of the organization of Freemasonry working clandestinely within society to effect world-wide change. These changes were meant for the overall good of humankind, while at the same time being anarchistic in their view of a one world economy and government. Probably the work of one man, most likely Lutheran minister Johannes Valentine Andrae, the documents have had the effect of change upon the imagination, and metanoia upon the hearts of those receptive readers in every succeeding age. Whether this has also caused an effect upon world governments is open to speculation, however, the Rosicrucian utopian vision has not (yet ?) taken concrete hold upon mankind. Through the symbology of the DAT ROSA MEL APIBUS, the intersection of the spiritual and the physical worlds, access to the utopian state of mind afforded by the Rosy Cross manifestoes is gained. The red rose is the consummate Christian symbol of martyrdom. St. Ambrose, one of the four great Doctors of the Catholic church, tells us that before it became a flower of the earth, the rose grew in heaven without thorns. Following the Fall of Adam, which brought everything spiritual into the material realm, the rose took on thorns to remind humankind of its sins, while its beauty and fragrance remained to remind one of the Paradise lost. Thus, the Virgin Mary is known as the “rose without thorns” as she was exempt from original sin. Roses in connection with Christian saints generally represent their (re)ascent into heaven. Since this love life is held back in all the bees except a single queen, the sexual life of the beehive is transformed into all of this activity that the bees develop among themselves…This is a very wise form of life. -Rudolf Steiner, Bees, (Hudson: Anthroposophic Press, 1998). The Spider represents the miserly Devil, who sets traps and bleeds the victim of human frailty, symbolized by the cobweb. 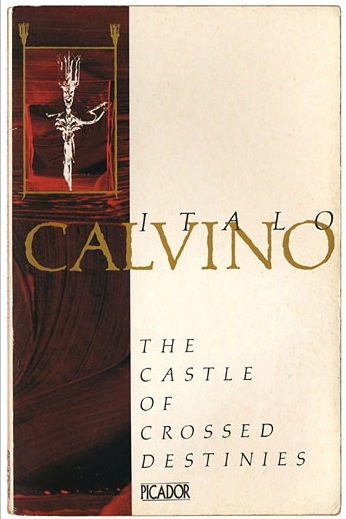 The cross, and especially the center, at the crossing point, the bindu; is the intersection where the spiritual meets the material plain, as in the Rose of Sharon. Sharon and of Sharon or Lassharon in Hebrew defined as “plain,” “honest,” “tranquil,” and “harmonious.” Where spirit enters the center the rose appears. The rose in DAT ROSA MEL APIBUS is not, as has been described above, restricted to Christian symbolism. Christianity after all is a religion that developed by virtue of its syncretistic assimilation of several older traditions. This symbolism transcends the particular to become universal in its application and essence. It is true, however, in keeping with the Christian description, that if the viewer of this image accesses the spirit if the rose, the thorns will no doubt disappear. Case, Paul Foster. The True and Invisible Rosicrucian Order. Wieser, York Beach, 1985. Codex Rosae Crucis D.O.M.A. A Rare and Curious Manuscript of Rosicrucian Interest. The Philosophical Research Society, Inc., Los Angeles, 1938. Eberly, John. The “Arabic” Parts of the Original Rosicrucian Documents. Caduceus – The Hermetic Quarterly, Vol. 2, No. 2, Seattle, Summer, 1996, pp. 16-32. Eberly, John. Rosicrucian Essays. Anamnesis Press, 1996. Jennings, Hargrave. The Rosicrucians: Their Rites and Mysteries. Chatto, London, 1879. Langstroth, L.L. and Dadant, Charles. Langstroth on the Hive and the Honey Bee. Chas. Dadant & Son, Hamilton, 1904. Maeterlinck, Maurice. The Life of the Bee. Dodd, Mead, and Company, Cornwall, 1901. McIntosh, Christopher. The Rosicrucians-The History, Mythology, and Rituals of an Esoteric Order. Weiser, York Beach, 1997. Randolph, Paschal Beverley. Ravalette – The Rosicrucian’s Story. 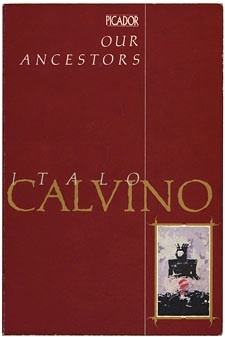 Philosophical Publishing Company, Quakertown, 1939. Waite, A. E. The Brotherhood of the Rosy Cross. Rider, London, 1924. White, Ralph (ed.) The Rosicrucian Enlightenment Revisited. Lindisfarne, Hudson, 1999. Yates, Frances A. The Rosicrucian Enlightenment. Routledge & Kegan Paul, London, 1972.